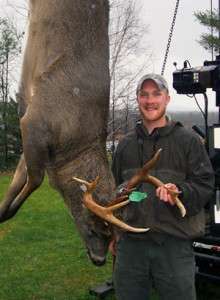 Maine Whitetail Adventures is dedicated to providing our customers a quality guided Maine hunting experience. Although we can not guarantee everyone a trophy we can promise to work hard for our clients, provide a safe hunting experience, and provide you with lasting memories. in 2012 – 263 lbs. Your Registered Maine Guide, Jayson Lucarelli, puts his knowledge to work for each of his clients. He spends many days prior to the season scouting for buck sign, looking for travel corridors and finding areas with higher deer densities. He also spends countless hours pre-season, preparing stand locations and setups to give his clients the best chance possible for a trophy Northern Maine whitetail. Come spend some time with Jayson, hunting deer in the remote Maine woods. You won’t regret it! !